There's no doubt videoconferencing has come a long way in the past few years. Technology that began as a fixture of sci-fi movies and at the highest end office buildings is now enjoyed regularly around the world, as a business support tool and even for personal use. It is official — whether we are talking business or letting our kids say hello to their grandparents, we all see real value in "being in the room" with those we are conversing with. But all of us who've tried it know that traditional videoconferencing isn't quite like being there. Quality is shaky and video and audio can be spotty… fine for that chat with grandma but not exactly ideal for the subtleties of business conversation. 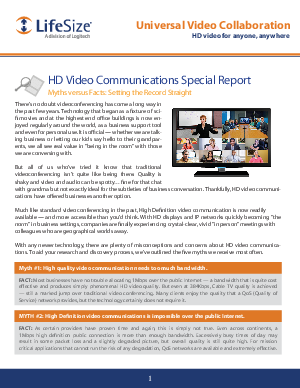 Thankfully, HD video communications have offered businesses another option.